Staining of human peripheral blood granulocytes with Mouse anti Human CD88 antibody, clone S5/1 (MCA1283). 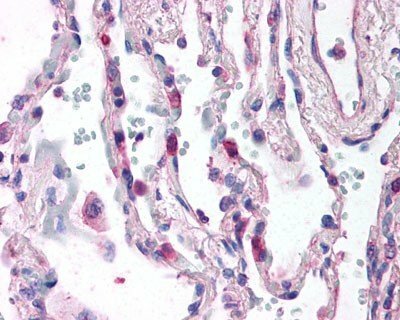 Staining of paraffin embedded human lung with Mouse anti Human CD88 antibody, clone S5/1 (MCA1283). Staining of human peripheral blood granulocytes with Low endotoxin Mouse anti Human CD88 antibody, clone S5/1 (MCA1283EL) followed by Rabbit F(ab')2 anti Mouse IgG:FITC (STAR9B). 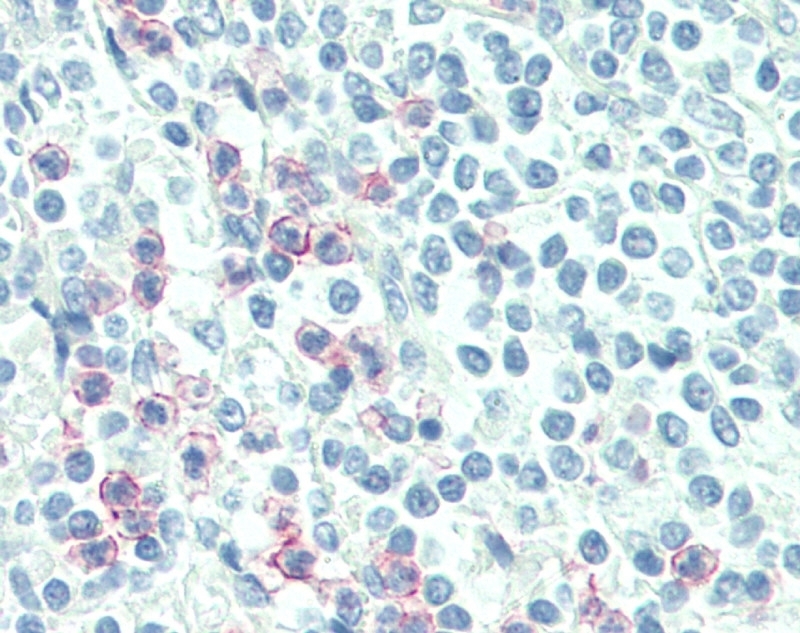 FFPE human spleen stained with Mouse Anti-Human CD88 antibody, clone S5/1(MCA1283), biotinylated Anti-Mouse IgG and Streptavidin Alkaline Phosphatase (red). Nuclei were counterstained with hematoxylin. 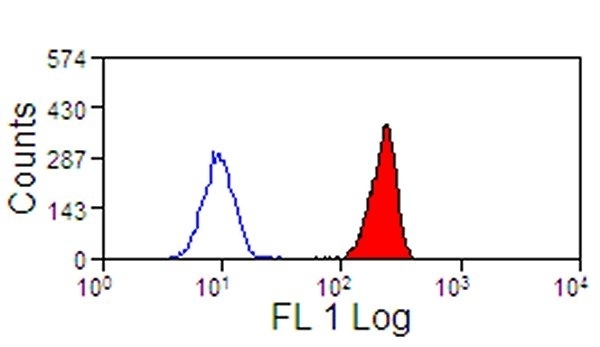 Mouse anti Human CD88 antibody, clone S5/1 recognizes the C5a receptor (C5aR) CD88, which is predominantly expressed on cells of the myeloid lineage. Clone S5/1 was raised against a synthetic peptide comprising the N-terminal extracellular domain of the C5aR (met1-Asn31) and has recently been shown to recognise the heptameric peptide (D15DKDTLD21). Clone S5/1 has been shown to inhibit the binding of C5a to its receptor. C5aR - peptide: Met1 - Asn31. Spleen cells from immunised BALB/c mice were fused with cells of the X63-Ag8 myeloma cell line. 1 Bio-Rad recommend the use of MCA1283EL for functional studies. Use 10ul of the suggested working dilution to label 5 x 105 cells in 100ul. Oppermann, M. et al. (1993) Probing the human receptor for C5a anaphylatoxin with site-directed antibodies. Identification of a potential ligand binding site on the NH2-terminal domain. Oppermann, M. et al. (1995) Antibodies from the myeloid panel that react with the C5a receptor and antagonize C5a biological activity. In: Schlossman, S.F. (ed.) Leucocyte Typing V. O.U.P. pp 955-956. Werfel, T. et al. (1996) CD88 antibodies specifically bind to C5aR on dermal CD117+ and CD14+ cells and react with a desmosomal antigen in human skin. J Immunol. 157 (4): 1729-35. Oppermann, M. & Götze, O. (1994) Plasma clearance of the human C5a anaphylatoxin by binding to leucocyte C5a receptors. Sopp, P. et al. (2007) Cross-reactivity of mAbs to human CD antigens with cells from cattle. Vet Immunol Immunopathol. 119: 106-14. Camous, L. et al. (2011) Complement alternative pathway acts as a positive feedback amplification of neutrophil activation. Corrales, L. et al. (2012) Anaphylatoxin C5a Creates a Favorable Microenvironment for Lung Cancer Progression. Hüttenrauch, F. et al. (2005) G protein-coupled receptor kinases promote phosphorylation and beta-arrestin-mediated internalization of CCR5 homo- and hetero-oligomers. J Biol Chem. 280: 37503-15. Sumichika, H. et al. (2002) Identification of a potent and orally active non-peptide C5a receptor antagonist. J Biol Chem. 277: 49403-7. Thivierge, M. et al. (1999) Modulation of formyl peptide receptor expression by IL-10 in human monocytes and neutrophils. Schreiber, A. et al. (2009) C5a receptor mediates neutrophil activation and ANCA-induced glomerulonephritis. J Am Soc Nephrol. 20: 289-98. Eglite, S. et al. (2000) Requirements for C5a receptor-mediated IL-4 and IL-13 production and leukotriene C4 generation in human basophils. Conroy, A. et al. (2009) C5a enhances dysregulated inflammatory and angiogenic responses to malaria in vitro: potential implications for placental malaria. Kraft, K. et al. (2001) Characterization of sequence determinants within the carboxyl-terminal domain of chemokine receptor CCR5 that regulate signaling and receptor internalization. J Biol Chem. 276: 34408-18. Fukuoka, Y. et al. (2008) Generation of anaphylatoxins by human beta-tryptase from C3, C4, and C5. Aasted, B. and Viuff, B. (2007) Reactivity of monoclonal antibodies to human CD antigens with cells from mink. Huang, L. et al. (2005) Discovery of human antibodies against the C5aR target using phage display technology. Tseng CW et al. (2015) Increased Susceptibility of Humanized NSG Mice to Panton-Valentine Leukocidin and Staphylococcus aureus Skin Infection. PLoS Pathog. 11 (11): e1005292. Bettoni, S. et al. (2017) Interaction between Multimeric von Willebrand Factor and Complement: A Fresh Look to the Pathophysiology of Microvascular Thrombosis. J Immunol. 199 (3): 1021-40.